It was great watching Parag Khanna on TED mapping the future of countries. He published ‘The second world’ last year and talks with authority of current geopolitics. What is “The Second World” from the title of your book? Europe is often portrayed in the U.S. as having an unsustainable socialist economy that will soon collapse under its own weight. You see it in a very different light. Every day on the news we hear about how our own medicare and social security systems are under great stress and may collapse, so I’m dubious about such characterizations of Europe. At least their system works now and has for decades. Europeans are for more efficient in public management with far lower inequality – America has a great deal to learn from them. Your view of Russia and its future is something I had never heard before. Would you talk a little about that? There are two very different views on Russia today, pitting those who view its recent short-term resurgence as heralding its return as a superpower (or at least an energy superpower) versus those who see the underlying instability in almost all aspects of its governance and economy. It has poor technology, a crippled infrastructure, a dying and sick population, an authoritarian government, and a great deal more weaknesses which will prevent it from ever becoming a superpower again. It continues to face widespread unrest in its south, while it’s de-populating eastern zones are increasingly Chinese populated. It simply isn’t logical to look at Russia on the map, as gigantic as it is, and think of it as a truly single, coherent, unified country. The world map is always changing, and Russia, whose map changed drastically for the worse when the Soviet Union collapsed, will continue to suffer in the coming decades. Where do India and Japan fit into your global view? I see India and Japan as two powerful swing states, sort of the second geopolitical tier behind the “Big Three.” They are not superpowers (Japan no longer and India not yet), but they can be important balancers in determing whether America or China becomes more powerful in the Pacific Rim region. At present, both lean towards the US and are suspicious of China, yet at the same time both are integrating with China economically much faster than before. So it is a delicate and precarious situation, one that very much embodies the tension throughout my book between globalization and geopolitics. It’s not clear to anyone how it will play out. Although the United States has, by far, the world’s most powerful military, you don’t seem to believe it is of much importance. Given that we are batting .000 in our foreign policy objectives such as stabilizing Iraq, resurrecting Afghanistan, and countering global terrorism, the burden of proof really falls on those who believe military power is most important. Around the entire world what I see is Europe and China investing into and buying greater shares of foreign economies—and thus gaining significant political and even military leverage over them—at our expense. Power has to be a fair balance among a range of tools, including the military, in order to be used effectively. We’re not doing that now, and I don’t see a good strategy coming out of Washington as to how to do it better. The big three—U.S., China and Europe—are all pursuing Central Asia with its huge oil and gas reserves. It also offers a textbook look at the different methodologies that each one uses to engage with the world. Very much so. The U.S. is the geographically most distant player and has at best been able to establish very small forward bases in the region in countries like Kyrgyzstan and Afghanistan. But in the former Soviet republics, this presence is highly unstable: we were kicked off our base in Uzbekistan in 2005, and the same could happen at Manas in Kyrgyzstan. Europe has been investing more and more in the region and has been very tough on political conditionality, freezing the travel of Uzbek officials and so forth. China directly borders the region, so has been pursuing pipelines, roads and trade in tandem to boost its connections to the region. All three styles of diplomacy are at play and in competition with each other. Whether the future of the region will be a return to the Silk Road era or the “Great Game” era is what I try to answer in the book. You write that economic well-being trumps ideology. Radical Islam, in the minds of most Americans, does not follow any norms of rational economic self-interest. Is our view distorted? How do you recommend we deal radical Islam and also the Middle East? Our view is beyond distorted: it is itself more irrational than the people to whom we ascribe irrationality. Quite a few studies have shown that terrorists largely come from the middle class and are pursuing very clearly articulated political objectives of resisting authoritarian regimes and American-backed aggression. There is no one policy for the Middle East, nor is there even a “Middle East” in my book. There are Arabs, and among them there are North Africans who can be elevated through the economic and political efforts of the EU; then there is the Mashreq where we need to push for a re-arranging of the borders of states such as Israel, Palestine, Lebanon, Syria and Jordan so that populations and ethic groups are not so fragmented and divided, but also allowing them to integrate more peacefully with their neighbors. Radicalism would not go away even if we did, but it could be dealt with through more socio-economically oriented programs that are driven from the ground-up rather than through our outside interventions. You’ve written about America decaying from within, particularly with its growing gap between the rich and poor. Can we even afford to be playing the Empire game? Is there any historical precedent for a country going into debt to a rival (in our case China) to fund its foreign wars? Wars do of course often cause indebtedness, but indeed we are already there! The American government does not think in guns or butter terms though, so the rich-poor gap is not an effective argument against changing our foreign policies. Those who defend our current over-stretch will always say that the percentage of GDP spent on the military remains very low, which is true. I argue that playing the empire game is nothing less than playing the globalization game, which means we need to channel even more foreign investment into America, but steer it towards rebuilding our society and creating jobs. Charles Krauthammer once wrote that “America’s purpose should be to steer the world away from its coming multipolar future toward a qualitatively new outcome — a unipolar world whose center is a confederated West.” It’s clear from your book that you disagree, but what are the long and short-term consequences of America pursuing this neoconservative ideology. At present we are pursuing neither the course Krauthammer advocates nor the one I do! We have alienated Europe and accelerated its coalescence into an alternative pole of power within Western civilization. America and Europe will surely continue to partner on a great many things (trade, Afghanistan, Mideast issues, etc. ), but that still ignores the fact that the East already is far too powerful for anyone to claim that the West alone would be the sole pole of power. In other words, Krauthammer’s vision is not only wrong, but it’s too late anyway. We need to do things that integrate East and West, not things that inspire the East to rise against the West. In 2008, the Boston Consulting Group ran a lifestyle survey of 12,000 women in 22 countries. Their survey findings inform the conclusions in Women Want More, a book that details the burgeoning women’s consumer market. I have not read the book. Here is a book review which I picked up from the web. Each chapter includes statistics, company stories, and anecdotes from individual women. Readers finish the book with an idea of how women behave as consumers, and how to gear their products for success in the female economy. Authors: BCG Senior Partner Michael Silverstein, who wrote Trading Up (2003) and Treasure Hunt (2006). Co-written with BCG Partner Kate Sayre. Recommended for: Corporate leaders and marketers who want to tap the growing women’s consumer products sector. Women comprise a huge potential market for companies. They control almost $12 trillion of the $18.4 trillion in worldwide consumer spending (65%). By 2028, they will control 72%. Over the next five years, they will gain $5 trillion in earned income. The result? A consumer market bigger than China and India. That’s just the beginning. So far, 80% of unemployment growth has been male, making the term he-cession ring true. Women own 40% of US businesses—and that number is growing. Women make most of the household decisions about travel, cars, and electronics. Many control household finances. With economic potential like that, companies need to think seriously about catering to discerning females. “Making it pink” just won’t work. 1) Most women are employed. 2) At the same time, women still do all the housework. 3) As a result, they’re stressed. 4) Finally, in an unrelated vein of womanhood, they don’t feel skinny or pretty. * Women’s happiness, as correlated with age, is a V-shaped curve. That means women are happiest when they’re young and old, but not so much in between. The authors claim there are still a lot of first-mover advantages in the female market. Overall, women fell pressured for time and stressed. They’re constantly looking for products that meet their specific needs (unlike men, who are more loyal to brands). If you create a product that saves women time, feel in control of their finances, or offers other key features as defined in the book, you, too, can capture your piece of the femme pie. Low income, less education. Low-paying jobs or unemployed. Dissatisfied. Companies need to understand exactly who they’re trying to serve, and refine from there. Although the archetypes serve the purposes of this book well, they don’t take culture, lifestyle, and other important market aspects into consideration. They’re a starting point for companies, but not a definitive guide for defining a market segment. After explaining the archetypes, the book explores different categories of products that women care about. Each chapter is devoted to a category. Food, fitness, beauty, and apparel make up the first four categories. Financial services and healthcare, which women perceive negatively, make up the next two. The authors cover how women perceive each product category, how they spend their money on it, and how archetypes react to it. Quotes, statistics, and anecdotes about individual women add flavor to the chapter. The authors also describe commercial opportunities in each category, illustrating them with major corporations that “got it right.” These include Whole Foods, Curves, Olay, Banana Republic, and several other large corporations. Next, the book talks about women in low- and high-growth global economies. The former include Japan and Europe. The latter include BRIC, Mexico, and the Middle East. Readers learn more about the characteristics of women in those countries, and how to cater to them. Before concluding the book, the authors detail women’s attitudes towards charity and giving. The book is well-written, even fun to read. The statistics, stories, and quotes in each story engage readers with the subject matter. Some topics might feel familiar—of course women don’t have enough time—but the book adds value to previous assumptions by going into specifics. Sadly, several of the characters in the book aren’t original. One was sourced from Wikipedia; another came from a blog.. The authors have agreed to make revisions. Also note that the book targets leaders of large, consumer-goods corporations (who might, incidentally, read the book and hire BCG consultants). It doesn’t go into depth with regards to service industries, outside of financial and healthcare services. It doesn’t give readers refined tips, or schedules on how to revise their product offerings. One assumes that’s where the consultants come in. The book provides a general reminder to capture a growing market. It gives a deeper definition of who inhabits that market. And, as far as business books go, it is conventional. It covers established companies and brands. It does not mention burgeoning industries (eg. the green industry) or edgy innovations. The material is in-the-box and focused on big companies. Undoubtedly, that serves a purpose. Just know that the business wisdom within won’t push many boundaries. In sum: Useful and fun to read, but not groundbreaking. La Fondation Chirac a décerné un prix le 6 Novembre a deux adversaires nigériennes qui pendant une décennie ont été en opposition pour une question de religion. Le Prix pour la prévention des conflits récompense, pour sa part, l’Imam Mohammed Ashafa et le Pasteur James Wuye. Tous deux, anciens adversaires dans un antagonisme militant, ont su remettre en cause le recours à la violence pour se consacrer à la réconciliation des cœurs et des esprits, dans un Nigeria traversé par les fractures religieuses et ethniques. Le dialogue qu’ils ont engagé depuis plusieurs années continue de produire ses fruits et nous montre la voie. N’est ce pas formidable ? Imam Muhammad Ashafa and Pastor James Wuye are religious leaders who live in Kaduna, a city in northern Nigeria. Today, they work together to teach warring religious youth militias to resolve their conflicts peacefully. But they did not start out as peacemakers. Ten years ago, Imam Ashafa and Pastor James were mortal enemies, intent on killing one another in the name of religion. In 1995, Ashafa and Wuye formed the Interfaith Mediation Centre, a religious grass- roots organization that has successfully mediated between Christians and Muslims throughout Nigeria. Together, Imam Ashafa and Pastor James demonstrate extraordinary courage and dedication every day. Through their commitment to dialogue with their adversaries, and using religion as a resource, they leave us with a compelling example of what it takes to achieve peace and coexistence. As the world celebrates today, the fall of the Berlin wall which ostensibly sounded the start of a new era, I am reminded of two Russian words: Glasnost & Perestroïka. 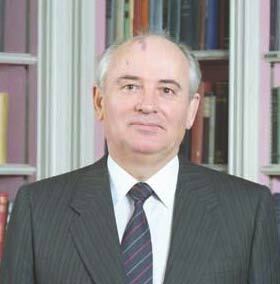 I am in great admiration of a great stateman who made history to the world: Gorbachev. Right after Mikhail Gorbachev took the office of the”General Secretary of the Communist Party of the Soviet Union” of the “Central Committee of the Communist Party of the Soviet Union” there were significant changes of the top Party leaders. He wrote the book Perestroika in 1987, which is now used in order to interpret beliefs of the time. Glasnost meaning ‘Transparency’ and Perestroika meaning ‘Restructure’ were the essentials of his book. The lessons of what happened to Russia, may very well apply today to each of us. ‘The necessity to be transparent and to be true to oneself’ is an exercise that each of us needs to perform. More so, this exercise of transparency becomes primordial in a social environment. Trust and trustworthiness can only be built through transparency. Easier said than done. Can you imagine the environment of mistrust and opacity prevailing in the Soviet communist era in the 80’s when the second most powerful position in Russia was the chief of the KGB? Likewise to act transparently to our environment is not an easy task. Then restructuring and rebuilding trust follows. Changes and the improvement could only smoothly happen in any organisation when the element of trust and the wish of one and all to work towards a common and compelling future. No wonder the most sought present training at Franklin Covey for organisation is “The speed of Trust”. Today on the celebration of the fall of the Berlin Wall, I see more the celebration of a great leader who succeeded in bringing new beginnings to the world. Hats off to you Mikhail Gorbachev! 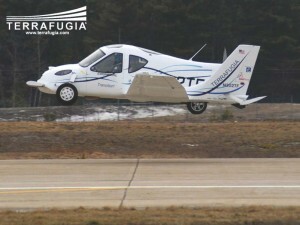 Woburn, MA – June 3, 2009: Terrafugia, Inc. has successfully completed the flight testing program designed for its Transition® Roadable Aircraft Proof of Concept. Having been dubbed “The Flying Car”, the Transition® completed its historic first flight on March 5, 2009 with 27 additional flights completed over the next several weeks. The successful completion of flight-testing with the Proof of Concept concludes the first stage of a four stage process to bring the Transition® into production. Work is underway on Stage 2, the Beta Prototype. First delivery is expected in 2011. The Proof of Concept vehicle is the first and only Transition® to be built thus far. It has now achieved its goals by demonstrating driving, flying, and automated transformation between the two in one integrated aircraft. The flights conducted a plan set specifically for the Transition®: characteristics such as handling, performance, and take-off and landing, stability and stall were evaluated. B-Roll footage is available of representative flights. The flight-testing program demonstrated the safety of the vehicle in the air while identifying modifications that will be incorporated into the next Transition® model to be built, the Beta Prototype. Categorized as a Light Sport Aircraft, the Transition® requires a Sport Pilot certificate to fly. It is a two-seat aircraft designed to take off and land at local airports and drive on any road. Transforming from plane to car takes the pilot less than 30 seconds. The Transition® will cruise up to 450 miles at over 115 mph, will drive at highway speeds on the road, and fits in a standard household garage. The vehicle has front wheel drive on the road and a propeller for flight. Both modes are powered by unleaded automotive gasoline. By giving pilots a convenient ground transportation option, the Transition® reduces the cost, inconvenience, and weather sensitivity of personal aviation. It also increases safety by incorporating automotive crash structures and allowing pilots to drive under bad weather. Refundable airframe reservations are currently being accepted. Terrafugia would like to acknowledge and thank its corporate sponsors: Ansys, Nor-Tech, SolidWorks Corporation, and CableOrganizer.com. Additionally, the following business partners have contributed to a successful flight testing program by furnishing equipment and services: SpaceAge Controls, Garmin International, Dynon Avionics, CO Guardian, David Clark Company, Bose Corporation, Telex Communications, Aloft Technologies, Icom Inc., JH Audio, and Air Graphics LLC. If I may claim to be of HAKKA descent amongst the Han of China, I am proud to be amongst the 100millions of HAKKA of this world. This is the estimated numbers according to HAKKA researchers. With the greatest pleasure I re-read the 60 pages booklet produced by Joseph Tsang Man Kin entitled: ‘HAKKA and HUAREN DESTINY Challenge and Response.’ It was a quick reading to arouse in me, my sense of being a HAKKA. I am proud of the values that I have absorbed and am ignited to the need to transmit them. I have a wish to document myself more on HAKKA, the history and their contributions to building the Chinese Nation and their spread in the world. I was reminded in Joseph book that the contribution of HAKKA to the Taipin rebellion is quite known, more recently it is now being let out the contribution of a number of HAKKA’s to the rebuilding of China after the great leap period past the lost of Mao. The word Hak KAa is itself an oxymore. Could be interpreted as Guest: Home or Foreigner: home. Has the HAKKA a nomadic gene to be always on the move or is it the continuous search for improvement of his lot that animate him? The image that comes up to my mind now is: a rolling stone will forcibly become a ball with no shape edges. The roaming to different places, the intermingling with different people, the experiencing different situations forcible transform self into a smooth and versatile body. As such, through centuries of roaming the HAKKA people have been refined in their ways and above all developed versatility and adaptability main traits, at least more than other Hans. On last Monday, I attended a talk and sharing around Tong Sin at Hua Lien club chaired by Andre Li. It was a very good idea and the function was well attended by some fifty members of Hua Lien club. 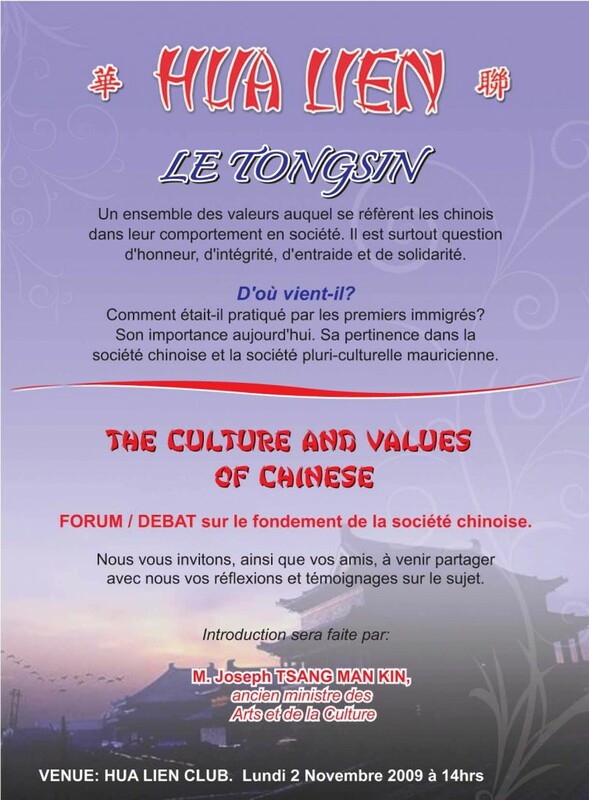 As indicated on the Hua Lien ‘s invitation, we meant to discuss on sets of values that drive the behaviours of the Chinese in our multi cultural society of Mauritius. The scope of the subject is so vast. When I read the invitation notice, I was glad that some frames were given to focus on the theme. However after attending to the wonderful and very pleasant meeting, I came out with much learning from the various speakers and yet still hungry for more learning and hungry for an action plan for myself and a collective action plan. Was it meant to be only an awareness session? I identified as part of the discussion would be on Culture and Values of the Chinese in Mauritius as practiced by our ancestry. The 2nd November being the day of remembering of the arrival of our forefathers, I thought that it would be an occasion to review the values and behaviours that drove the early settlers to succeed and transmit to them to the community. In the same time bring to light those values and behaviours identified as singular or of highest importance to the Chinese settlers and offer them for integration to the National heritage. Whilst I argue that all human values may be the same for humanity, each community may well classify their order of preference differently. Respect to the elderly specially Parents, for example is rated amongst the top values in Tong Sin. This might not have the same rating in other communities. Duty to the community supersedes duty to self is very Chinese: yet another example which illustrates the hierarchy of values especially in this present individualistic generating tendency. When the concept first emerged in eighteenth- and nineteenth-century Europe, it connoted a process of cultivation or improvement, as in Agriculture or Horticulture. In the nineteenth century, it came to refer first to the betterment or refinement of the individual, especially through Education, and then to the fulfillment of Nationalism. In the mid-nineteenth century, some scientists used the term “culture” to refer to a universal human capacity. In the twentieth century, “culture” emerged as a concept central to Anthropology, encompassing all human phenomena that are not purely results of human genetics. Specifically, the term “culture” in American anthropology had two meanings: (1) the evolved human capacity to classify and represent experiences with Symbol, and to act imaginatively and creatively; and (2) the distinct ways that people living in different parts of the world classified and represented their experiences, and acted creatively. Following World War II, the term became important, albeit with different meanings, in other disciplines such as Sociology, cultural studies, Organizational psychology and Management studies. Roland Tsang was designated to be the scribe for the meeting and I shall be waiting for his report. For my part I have observed several traits of our ancestors who drove them to succeed in the early days. Based on the history books I have read on the early Chinese settlers, it would appear that they had a high sense of identity. The men would wear their Chinese hats and kept their long pleaded hair to go around the country attempting to sell their wares. Their dress and demeanor identify them and they proudly showed themselves in spite of unpleasant remarks from others. Consciously knowing who they were, where they came from and where they were going gave them an unbeatable mental construct to wage all adversities. They were 1. Emotionally resilient and 2. Persistent in their sense of duty, thus hard working with a sense of purpose. Emotional resilience was their main asset: they have demonstrated positive behavioural adaptation. This resilience is defined as a dynamic process that individuals exhibit positive behavioural adaptation when they encounter significant adversity or Psychological trauma. Resilience is a two-dimensional construct concerning the exposure of adversity and the positive adjustment outcomes of that adversity. Adversity refers to any risk associated with negative life conditions that are statistically related to adjustment difficulties, such as poverty, or experiences of disasters. Positive adaptation, on the other hand, is considered in a demonstration of manifested behaviour on social competence or success at meeting any particular tasks at a specific life stage. At the meeting at Hua Lien, I heard one of the participants making a remark on his blurred identity. The question that I am asking myself now: In the light of the changing environmental factors are we as a community able to reproduce these traits & strength needed for our survival or progress? How our Tong Sin would nurture our behaviours to contribute to the nation? Would there need to search in our heritage of Tong Sin traits, values and behaviours to be in congruence with today’s realities of a fast shrinking numbers of our community and cultural metissage? Are we today conscious of the necessity to reconstruct ourselves for the new environment we shall be faced in the coming years?